While the monarch butterfly is not an endangered species, its migration is considered an “endangered natural phenomenon.” The following resources provide helpful information in promoting monarch stewardship and conservation. Butterfly gardens are easy to plant, and you can design one that gives monarchs habitat throughout their breeding cycle. This U.S. Forest Service web site provides a list of the many government agencies, organizations, and individuals across North America that are working on projects to conserve monarch habitats and the migration phenomenon. The Monarch Butterfly Fund works to foster the conservation of North American Monarch butterflies and their migration through habitat restoration, research, monitoring, education and support for sustainable community development in and near monarch habitats in Mexico. To offset the loss of milkweed and nectar sources, Monarch Watch encourages people to create, conserve, and protect milkweed/monarch habitats. "Monarch Waystations” can be established in home gardens, at schools, businesses, parks, zoos, nature centers, along roadsides, and on other unused plots of land. Without a major effort to restore milkweeds to as many locations as possible, the monarch population is certain to decline to extremely low levels. 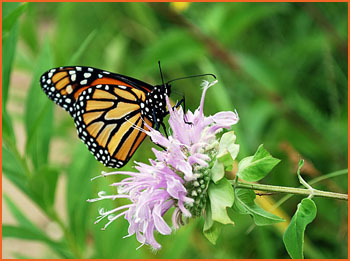 Monarchs depend upon a wide range of habitats in Canada, the United States and Mexico, thus conservation of their migratory phenomenon requires trilateral cooperation. The North American Monarch Conservation Plan (NAMCP) is intended to provide a long-term cooperative agenda for conservation of the monarch butterfly.